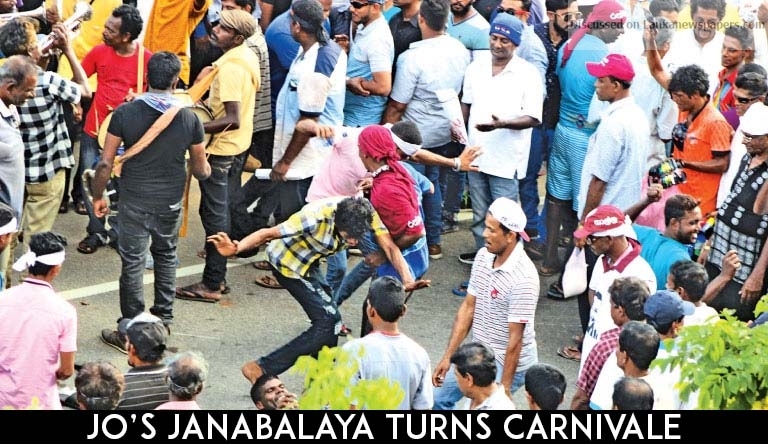 Full of sound and fury, the Joint Opposition-Sri Lanka Podujana Peramuna Janabalaya demonstration reached Colombo Fort yesterday, but the protest took on a carnival like atmosphere with no major political speeches or centralized coordination to drive its key messages home. The rally, which was set up to be a launch pad for Hambantota District MP and former first son Namal Rajapaksa, brought thousands to the Lake House round-about by 4 PM. Joining the marchers near the Colombo Fort Railway station, former President Mahinda Rajapaksa and his brother Gotabhaya Rajapaksa and their security contingents rode in convoy through the crowds. The final location of the protest was kept a tightly guarded secret till noon yesterday, but the decision backfired since there was no apparent leadership, leaving the crowds without direction once they got to Fort. In high spirits, the protestors ate ice lollies and spicy pineapple and danced on the street while papare bands provided music, in what appeared to be more like a big match party than an anti-Government demonstration. Confusion reigned till 7 PM, when SLPP Colombo Municipal Council Member and Spokesman for former Defence Secretary Gotabhaya Rajapaksa, Milinda Rajapakshe claimed the ‘crowds would have to decide if they were going to stay overnight or disperse,” even after rash promises by JO leaders that they would ‘occupy’ the city till Thursday if the Government did not provide an adequate response to the protest. Residents of the city of Colombo cleared the way for the JO demonstration, with many offices allowing employees to work from home, while parents kept children away from school fearing the demonstration would block roads by afternoon, making it impossible to fetch them back home. Offices in the Colombo Fort and Pettah areas also sent employees home early, fearing they would be stranded in the city centre once the rally began. Trains and buses were packed to the brim as commuters rushed to get out of Fort before the march moved in. Traffic was at a minimum throughout the city except in the Fort area between 2-8 PM. “The problem was that Namal Rajapaksa was more interested in showing his strength to his uncle, rather than to the Government,” quipped one SLFP member who wished to remain anonymous, after the rally ended uneventfully last night. While the former Defence Secretary made an appearance at the demonstration, supporters of his bid for the Presidency believe the show of force may have been much stronger if it had been organized by his team. The anti-government protest organised by the Joint Opposition brought productivity in Colombo to a standstill. Businesses in Pettah, the busiest commercial shopping district in the island, where most of the shops, textiles, buildings and many other business organisations are centered shut doors early, a majority of employees from the vibrant World Trade Centre located in Fort, the heart of the Central Business District took a half day at their workplaces. “We closed our offices early anticipating the heavy inconvenience this protest will cause to the employees. We have lost a lot of businesses due to this,” a chief executive of a prominent organisation involved in IT and BPO services industry, whose office is located at the bustling World Trade Centre in Colombo said. However, small-time vendors like ice cream sellers, grams, water bottles, pineapples and other snack retailers had a field day with brisk business in what seemed a day- night carnival. Speaking to the Daily News, Justice Minister Thalatha Athukorale said she was saddened by the fact that the Rajapaksas who drove the country into an economic crisis by miring it deeper and deeper in debt were now deliberately doing further damage even in opposition. “Productivity in the city of Colombo was at a standstill because of the JO show, so many parents did not send their children to school today fearing chaos,” the Justice Minister said. It was grossly unfair to deny children access to education, but it was in the Rajapaksas don’t place a heavy value on education, she added. “Worse still children had to stay home from school, and when they put the TV on at night, they have to watch drunk men roaming the streets of the city,” she charged. Minister Kabir Hashim said the JO was hoping this demonstration would be something like the UNP Jana Bala Meheyuma of 2001. “What they wanted was a crackdown like there was in 2001. They wanted the police to fire into the crowd, tear gas the protestors and bring war to the streets of the capital. In short they wanted the Government to act like a repressive regime – but this is a democratic government and we proved it today – they came, they protested and they left. They have left a mess behind in the city, but just like the economy, we will clean it up. Tomorrow we get on with business,” Hashim told Daily News. Bandara claimed the leaders of the SLPP had booked rooms in several five-star hotels, while hoping to get their supporters to sleep on the streets. Deputy Minister Ajith P Perera who was also at the press conference last night, said 81 people who had passed out from intoxication had been rescued by the 1990 ambulance service and taken to hospital. “This was an immature effort,” Perera asserted. Crowds were later seen being addressed by JO stalwart parliamentarian Wimal Weerawansa in clusters. But without a stage or a grounds booked for a rally, there were no speeches by the former President or the former Defence Secretary, or even Namal Rajapaksa who organised the Janabalaya Colambata march. Thousands of police personnel were on standby, but none were visible in proximity to the demonstration, which concluded peacefully by 8PM, with much of the crowd dispersing and returning to their buses much earlier. Significantly no riot police squads or STF personnel were deployed near the protestors.